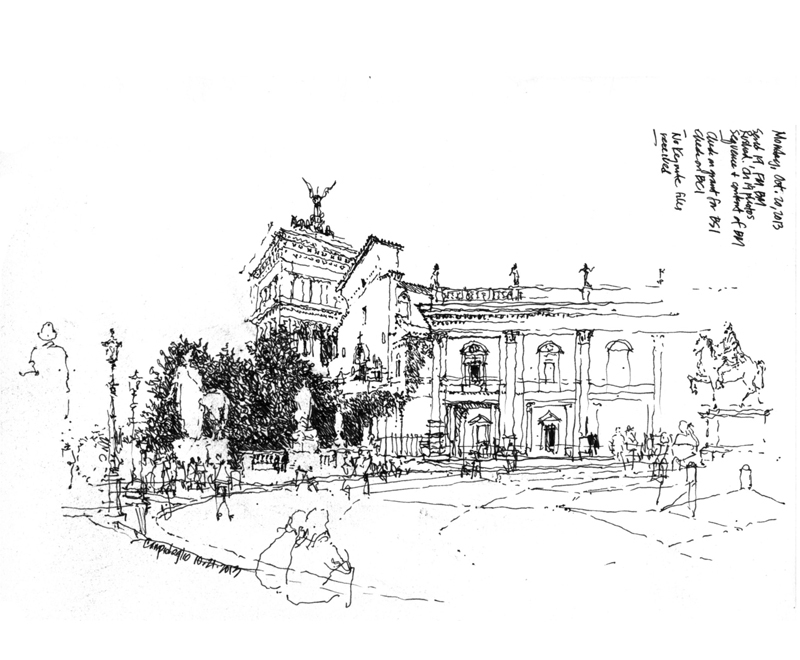 Similar to the drawing of the archway of the Portico of Octavia, this sketch compresses three layers of history in the heart of Rome—in the right foreground, the facade of the Palazzo Nuovo designed by Michelangelo in the 16th century; rising in the background, the Vittorio Emmanuele II Monument built in the early 20th century; and caught in between but the oldest, S. Maria in Aracoeli, a basilica whose origins date back to the 6th century, erected atop an ancient Roman insula. To the right stands the equestrian statue of Marcus Aurelius that is situated in the center of the trapezoidal piazza. We’re leaving tomorrow on a week-long field trip south to Pompeii, Amalfi, Ravello, and possibly Matera, a UNESCO world heritage site. More on that later.